A year into his investigation, the special counsel has alleged or confirmed serious criminal activity, and he's not close to done. 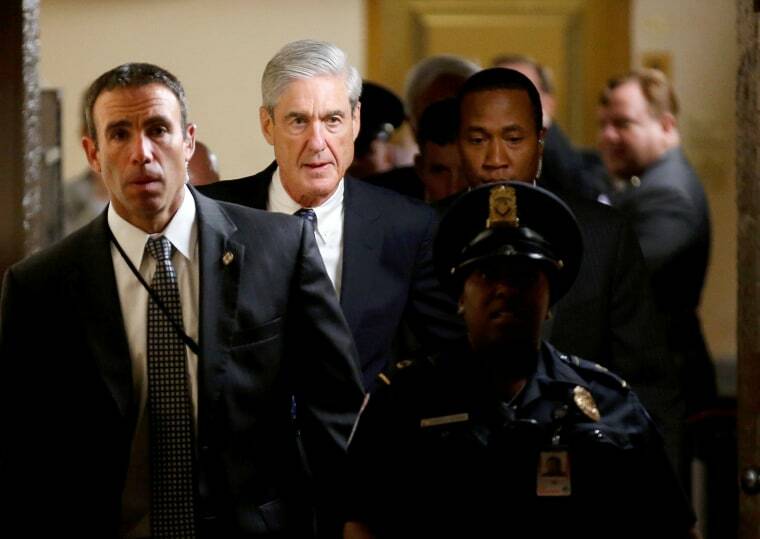 WASHINGTON — A day before the anniversary of the appointment of special counsel Robert Mueller, the news broke that Mueller's office had subpoenaed documents and testimony from a Republican social media consultant named Jason Sullivan. Like much about his investigation, the precise nature of Mueller's interest in Sullivan, who worked for a political committee run by longtime GOP consultant and former Trump adviser Roger Stone, is unclear. But the revelation suggested this much: Twelve months after Mueller was appointed — and nearly two years after the FBI first began examination of whether members of the Trump campaign conspired with an unprecedented Russian election interference effort — that probe is showing no signs of ending anytime soon. In a complex investigation into financial dealings and potential corruption, "a year is a blink of an eye," said former federal prosecutor Chuck Rosenberg, an NBC News legal analyst. As the anniversary approached, President Donald Trump's new lawyer, Rudolph Giuliani, continued a tradition among Trump's representatives of suggesting that the end of the Mueller investigation is just around the corner. But there is no evidence to support that, and a lot of evidence to the contrary. "Congratulations America, we are now into the second year of the greatest Witch Hunt in American History ... and there is still No Collusion and No Obstruction," he tweeted. It has already alleged — and in some cases, confirmed — significant criminal conduct. The special counsel's office has charged 19 people — including four Trump campaign advisers — and three Russian companies. Trump's former national security adviser, Michael Flynn, his deputy campaign chairman, Rick Gates, and a former campaign aide, George Papadopoulos, have pleaded guilty and are now cooperating with the probe. Former Trump campaign chairman Paul Manafort is facing a raft of bank fraud, tax fraud and money-laundering charges that could land him in prison for the rest of his life, if he is convicted. It's divided into two main areas: collusion and obstruction. The obstruction inquiry may be all but finished. The collusion inquiry may just be beginning. Mueller's original mandate was to investigate Russian interference in the 2016 election, including whether any members of the Trump campaign were involved. But after Trump told "NBC Nightly News" anchor Lester Holt that he fired FBI Director James Comey with the Russia investigation on his mind, it emerged that Mueller was also investigating whether Trump had obstructed justice. One year into Mueller's Investigation: what now, and what's next? NBC News and other news organizations have reported that Mueller is close to finishing the obstruction of justice portion of the investigation. Giuliani told Laura Ingraham of Fox News on Wednesday that Mueller has "gotten 1.4 million documents, he's interviewed 28 witnesses. And he has nothing, which is why he wants to bring the president into an interview." He appeared to be referring to what Mueller has obtained from the White House, because Mueller surely has interviewed far more than 28 witnesses in total. And many of those White House witnesses would have been relevant to the obstruction case. A lot of Trump's alleged conduct that seems relevant to obstruction has been made public, including the allegation by Comey that the president asked him to drop the FBI investigation into Flynn, and his requests to intelligence officials to say publicly they saw no evidence of collusion — which they refused to do. What is unknown is whether Mueller has evidence of other conduct that has not been made public that would make a stronger case. Much less is known about what Mueller has on the question of "collusion," which is shorthand for whether Trump or his aides participated in a criminal conspiracy with a foreign power to influence American voters. One big question is whether Papadopoulos shared with senior campaign officials the offer that was made to him from an apparent Russian agent to provide hacked Hillary Clinton emails, before those emails were released by WikiLeaks. The subpoenas to Sullivan were one more piece of evidence that Mueller seems to be interested in the question of whether Stone also had advanced knowledge of the hacked emails, something he denies. Stone has said he has not been interviewed by the special counsel's office. Mueller is expected to file charges eventually against some of the Russians who hacked and leaked. The big question is whether he will charge any Americans with helping. NBC News reported in March that Mueller's team has enough evidence and is considering charges accusing Russians, including Russian intelligence officials, of violating U.S. of statutes on conspiracy, election law and the Computer Fraud and Abuse Act. That move would be important for two reasons. One, it would establish the crime at the heart of the matter, and make it easier to establish that Trump obstructed justice, if in fact there is evidence to prove that. Two, it would make it easier to charge any American who helped the Russians as a co-conspirator, even if they didn't participate in the actual hacking and leaking. Mueller is almost certainly sitting on some explosive secrets. That single Treasury document pales in comparison to the trove of financial records Mueller's team is believed to have obtained on Donald Trump, including his tax returns, banking records and phone records, legal expert say. That means Mueller likely already knows the answers to many lingering questions about Trump's finances, including how the real estate mogul was able to pay cash for European golf courses and other purchases in recent years, after a history of being heavily leveraged. We still don't know what the cooperators — Flynn, Gates and Papadopoulos — have given Mueller in exchange for being allowed to plead guilty to lesser charges. It's likely, legal observers say, that there are some bombshells coming. How those bombshells will be delivered — in more indictments, or a report to Congress, or some other fashion — is one of the many unanswered questions about the Mueller investigation.